Relatively Retiring: Marked for Life. Here is the top of an oak sewing table. My father made it for my mother, long, long ago, when they were still at the stage of trying to impress one another. Last year my son put a glass of water on it, with the resultant white ring. He was apologetic when he realised the effect of water on old wood. I could have sanded and re-polished it, or even asked him to have a go at polishing and removing the stain himself, but I didn't. Now, from time to time, I see the mark and am happy to remember that my son was here, sprawled in a chair with a glass of water. He's not here very often, after all. 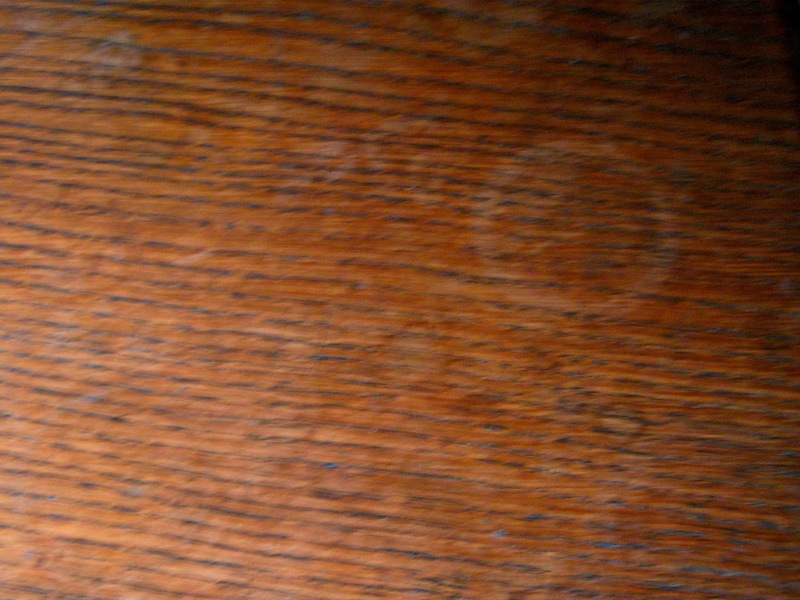 Today something triggered a conversation with a friend about honourable stains, marks that are made by life, for life. So many of these are part of my home, part of my life, not pretty, but stained and scarred, marked with honour. What makes honourable scars? I think it is the process of living, and the feelings and memories that are enshrined in the scars. Some might be created in anger, and there are places in this house which bear witness to powerful passions - yet I feel that these are honourable in their way, sad evidence of what can happen when parents are pushed that bit too far, and when everyone is exhausted. Cautionary tales. Would I ever want to live in a place that was pristine? Well, actually, it might be quite refreshing once in a while, but it would also be impersonal, featureless, whereas this place is a home, built up over the years, scarred by the years, just like me. Full of memories. The door-frame in the kitchen is notched with the growth records of the family and a few selected friends, including a dog. Every so often I paint around it carefully. Everyone seems to have stopped growing now, upwards at any rate, but nearly every time there are visitors in the kitchen they notice it and comment, and my sons still like to check that they were taller than their father by the time they were in their mid-teens. There are marks and wounds throughout the house. There's the place where the ballpoint pen leaked on the leather of a rather valuable desk, and I can still see my husband, dabbing at it ineffectually with a handkerchief loaded with spit, hoping that no one would notice. The armchair in the kitchen, beside the range, has supported more bottoms than I will ever know. So many hands other than ours have come in straight from the garden and rubbed dirt into the chair arms. So many other muddy feet have scraped along the stretcher between the chair legs. For many years during my professional life I wrote about antiques. I know patination when I meet it. It takes a century of dirt and hard wear to build up glowing scars like that chair has. Some of the more flamboyant scars have been repaired. There were teenage excesses that are better not recalled, but still lurking just beneath the surface....those incidents with the poker and the fire in the sitting room, for instance. Well, the brass poker is still badly dented. There is still glue and solder on a carpet up in the attic where younger son spent hours assembling extraordinary circuits, and there is a chipped and scarred rocking horse who has been ridden too hard by generations before and after me. My grandfather stretched the leather reins, as did my uncle and my father after him, and they finally came apart while my sons were riding. Perhaps I should have it restored, have the scars painted out, the leather replaced for the grand-daughter now on her way. Or perhaps she should also hold the battered old reins used by her great-great grandfather? Wonderful to have lived in the same place so long, with all its memories inscribed there. I lived in my childhood home until my mid 20s (except for college) but my parents then moved. I had my own place for about as long, but have since moved. So it's just the furniture that gets carted along with me, with only a couple of pieces of that remaining. Everyone is so mobile now. I wonder how many people these days stay in one place long enough for it to bear the marks of a lifetime. It must be wonderful to have all your memories in that same house - I have moved so often that my memories come with me but there are not the same scars to remind me. I think your grand daughter will be intrigued to see the horse with the marks left by her father when he was a boy so don't paint it over nor add new reins or anything - it is a treasure just as it is. Not long now is it? I have moved about a lot, but almost all of my furniture and many other possessions belonged to my mother, grandmother, uncle, aunt, not to mention the things my kids have "stored" in my house. I am reminded that once when my step-father purchased an expensive new table the seller asked whether he would like to have it "distressed" for another $100. He said no, he thought he could distress it himself. Like you, all I have has been distressed by ones I love. This house has a few scars, the stories lost, but the house remembers. We will leave our marks as well, as life leaves it's marks on us. Patina, proof of life, out of the box, kernels of history. Lovely post, I would reattach those old reins somehow, hope your grand daughter has fun with it! Leslee: we specialise in old houses in my family. My parents lived in a Tudor house where the bricks still bore the thumbprints of their makers. Literally touching evidence of past lives. Marigold: it's a real vindication of not doing restoration work, isn't it? Anne: I really like your phrase about being distressed by those you love. It applies to so much as well as furniture. Zhoen: Your blog shows just how much you care about the old memories in your new house. Mrs A: thank you, and yes, I'm sure the reins will remain. The leather is now ultra-soft for small hands. I think that the scars make a home from a house. The house I grew up in was bull dozed earlier this year and I was surprised at how said I was about its destruction. As you say, (mostly) honourable scars. 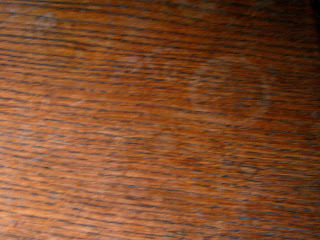 We have a small oak table know as 'Alf Perrin's dad's table' (he being it's maker) which has honourable water marks and scars - it's the perfect size to stand on to replace our lightbulbs. I never met AP's dad though I did know AP in his old age. It's a very sturdy table and likely to go on for many years yet - and the perfect height for doll's tea parties and lego houses. We also have a grandmother clock with a battered face and no hands which could tell some interesting tales. My mother never fussed over accidents and breakages and I've always been determined to be the same - it's only stuff, even if much loved and how else would you remember those silly infuriating moments of childhood! I am so glad to have found your writing. You tell so many wonderful stories, and make me think of so many different things. Thank you for all this. Elephant's Child: I'm sorry about the bulldozer - that's a sad loss. Jane: I like the name of Alf Perrin's Dad's table. Somewhere in a house of the past there was Flossie's Aunt's photo-frame I had forgotten it and wonder where it might be now - but I still have Grandmother's Christmas Cactus - unfortunately! F.N. Thank you for reading and taking the time to leave a comment. I am glad you have enjoyed things. oh yes this brought to mind some scars and stains from my own life - ink spilt darkly on my father's desk, the drill holes and saw marks on the edge of the little oak (I think) table where I tried out my 'toy' tools. Firebird: honourable scars indeed. Some of those 'toy' tools work surprisingly well, don't they? There is evidence of them here too. Molly: for some reason I'm surprised that your father-in-law's house seemed impersonal. I would have imagined a great many character lines would have been etched there, as I'm sure he etched them on the brains of others. I hope the clearing was not too difficult for you.